NINETY-year-old Jean Sussock can’t believe her luck! A keen angler until her sight began to fade almost 40 years ago, Jean thought her fishing days were well and truly behind her. 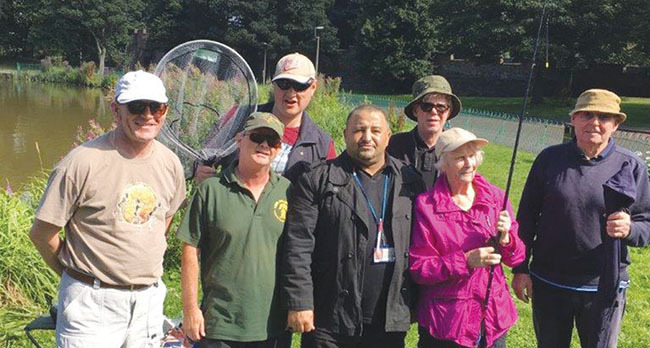 But she heard about a newly formed club for visually impaired anglers, signed up, and then went on to win a special prize at the club’s monthly fishing trip. Despite her blindness Jean is also an accomplished artist. The club is a joint initiative by Liverpool blind charities Christopher Grange Rehabilitation Centre and Bradbury Fields. Mike Bailey, manager at Christopher Grange, said: “Following an enquiry from a keen angler who could no longer drive due to being registered sight impaired, we found that other service users who had previously fished, were faced with similar problems. “We arranged a meeting and within weeks we formed the new club. “It’s really put a smile on lots of people’s faces, and gets people out and about again and having fun. The city council’s Physical Activity & Sports Neighbourhood Development Team has donated ten starter kits and other equipment, but the club needs plenty of volunteers. “We would be delighted to hear from any readers who can spare a few hours or if they want to donate any equipment,” added Mike.